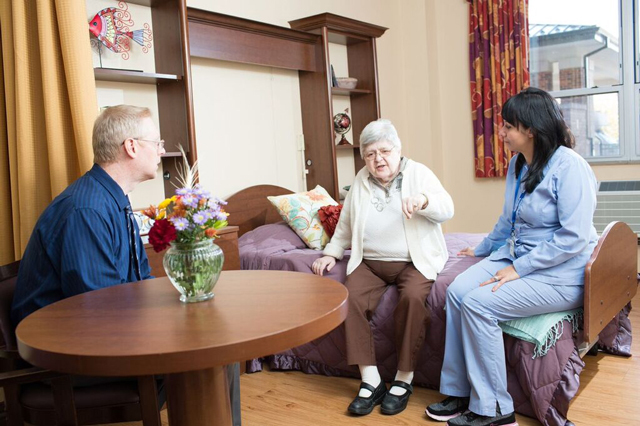 When a loved one is staying at a nursing home, it can be a time of adjustment for everyone. It is very common to worry about when to visit, what to say, and what to do. A visit however, is a wonderful time for bonding, connecting, and learning. It’s a very natural to feel as though you have to act a certain way or say certain things. Feelings of guilt, sadness and grief can be common. Please remember to keep the focus on the person you are visiting. As a “gift” to your loved one, set all those feelings aside and instead plan on a visit filled with smiles, love and positivity. There are some proven ways to make a better visit. Begin your visit with a warm greeting. Make eye contact, give a hug, hold hands, and let the person know you love them and are completely there for them. When visiting, it can be helpful to bring photo albums, music, games, or other items that encourage stories and sharing. Some families will bring recorders or notepads to capture these memories. This helps your loved ones know that they are leaving a legacy for future generations as well. It can also be helpful to plan your visits during a time that will be most convenient for the resident as well and any medical staff they may be interacting with that day. For many elders, the morning or mid-days can be the times they have the most energy and alertness. You can always call ahead and speak to the unit nurse about when may be the best time for a visit. At Generations, we take a family approach with all of our residents. We want your loved ones to feel that they are receiving the best care possible in a warm, loving and home like environment. Our staff will be happy to accommodate the needs of loved ones, family and friends to have the best possible visits.